CARBONDALE, Ill. – A doctoral student at Southern Illinois University Carbondale is among a team of researchers who recently discovered a new species of great ape living in Indonesia. 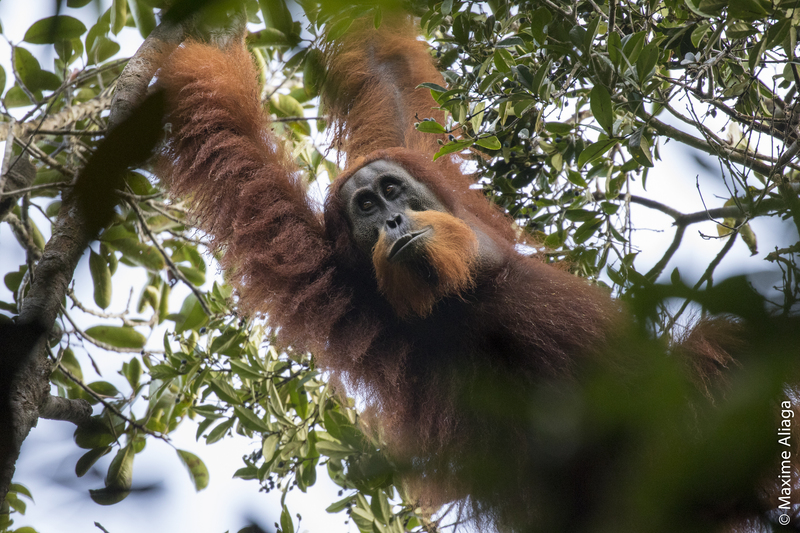 Matthew Nowak, who is earning his doctorate in anthropology at SIU, helped discover the Tapanuli orangutan, known also by its scientific name, Pongo tapanuliensis, in the upland forests of North Sumatra. The species is extremely rare, consisting of no more than 800 individuals, making it the world’s most endangered great ape. The international team’s work is being published today in the journal Current Biology. Evidence for the new species includes morphological and extensive genomic evidence. Nowak became involved in the research after arriving in Indonesia in 2010 to complete his doctoral work. The work involved a comparative study of the ape populations that live in the Batang Toru Ecosystem, a forested area that is also home to the Tapanuli orangutan. After completing his field work, the director of the Sumatran Orangutan Conservation Programme invited him to stay in the area and assist with the organization’s work. Researchers have studied orangutan populations in the area for almost 50 years, but only “rediscovered” the Batang Toru population during a series of field surveys in 1997. In 2005, the SOCP and other non-governmental organizations intensified research and conservation efforts on the orangutans in the Batang Toru Ecosystem, establishing a research station in 2006. The station allowed researchers to obtain a more detailed look at the apes’ behavioral ecology and genetics. By chance, a 2013 conflict between humans and orangutan resulted in the death of an adult male ape, making its skeletal material available to the researchers. Nowak and some colleagues then realized the Batang Toru population was unique from other known species. But while its skull was quite different from other orangutans, the team knew they needed more evidence to evaluate the population, which included DNA testing. Early results were promising, Nowak said. The researchers undertook the largest genomic study of wild orangutans to date, made possible by decades of data collection at most of the field sites where orangutans are studied. For years, researchers had been investigating the genetic structure and evolutionary history of the known orangutan population, identifying three very old lineages, even though only two species were currently known to exist. The researchers theorized the Batang Toru population might be that missing third species, with DNA and behavior observation research eventually supporting that theory. Further computer modeling by other members of the team indicated the population had been isolated from the other Sumatran populations for at least 10,000 to 20,000 years, after which, the already low levels of male-driven gene flow ceased. Nowak said the work was a dream come true for a scientist, and he feels lucky to have been part of it. Nowak, who also earned his master’s degree at the university, said SIU has helped him be in the right place at the right time throughout his academic career.